Companion laser engraved headstones are designed for soul-mates and feature your favorite photograph laser engraved on the surface. Each laser engraved marker is made from jet black granite, which provides perfect contrast with the lighter engraved parts. 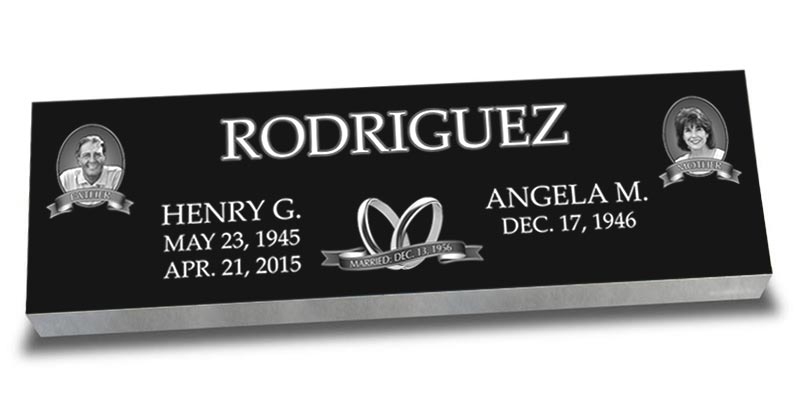 This personalized laser engraved headstone will stand apart from any other in the cemetery. Specially designed for two persons buried in side-by-side graves, our companion laser engraved headstone line is perfect for married couples wishing to spend eternity together. They are fully customized featuring your favorite photograph laser engraved onto the jet black granite surface. Each granite headstone incorporates either a single photograph of 2 persons or 2 separate photos of each person. It is then personalized with their names, dates and any additional lettering. Upon receipt of your order we will contact the cemetery (provided you select to have it shipped to a cemetery) and make certain your granite headstone meets their requirements before it is sent to production. Any required changes will be brought to your attention for your approval. Before the headstone is engraved, you will be emailed a layout proof showing the memorial as it will appear when finished. We will not proceed with production until you are satisfied with the drawing and give us your approval. 48" x 14" x 4"